Actress Helena Bonham Carter in her Z-Coils. 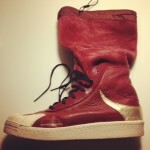 JSlow’s Monday post made me realize how many barriers exist between our feet and the shoes of our dreams. And while JSlow crows about her perfect paws, I happen to know that even she occasionally complains that certain styles make her petite feet (size 6) look like hooves. I’m lucky that I never developed the bunions, corns or hammertoes many of my friends earned from years of confining their feet to pumps and loafers, which epitomized professional footwear made popular during the end of the last century. My lack of foot protuberances probably has something to do with the fact that I’ve worked from home for most of the past 12 years and thus go shoe-less most days. But I’m sure my days are numbered based on this sobering fact: 75% of adults will experience some sort of foot problem in their lives, and 80% will experience lower back pain, which also greatly impacts shoe selection. For the few years I didn’t work from home, I shared an office with my “day job” business partner affectionately known as “The Gouls.” The Gouls has plantar fasciitis and had to insert orthotics into his size 13 shoes. They squeaked which amused me to no end. During this time, my mom got very sick and spent a month in the hospital before she passed away. Many of her nurses bounced around in white shoes with springs for heels. 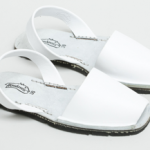 I asked them about their curious footwear and they explained that these miracle shoes, or “Z-Coils” gave them the cushioning they needed to spend 12-hour shifts on their feet. I was fascinated and had to find out more. So I decided to get a pair of Z-Coils for the Gouls. Not that they would ever see the light of day. I needed to have “an office pair” for him to sport when I needed a laugh during the incredibly sad aftermath of my mom’s death. Buying Z-Coils was serious business. There was paperwork to fill out and warnings to heed, for example, “Don’t wear Z-Coils around cables or rope, as the spring heel can become tangled and cause the wearer to trip and fall,” and “Be careful when driving as the coil can become caught on the accelerator pedal.” Duly noted. 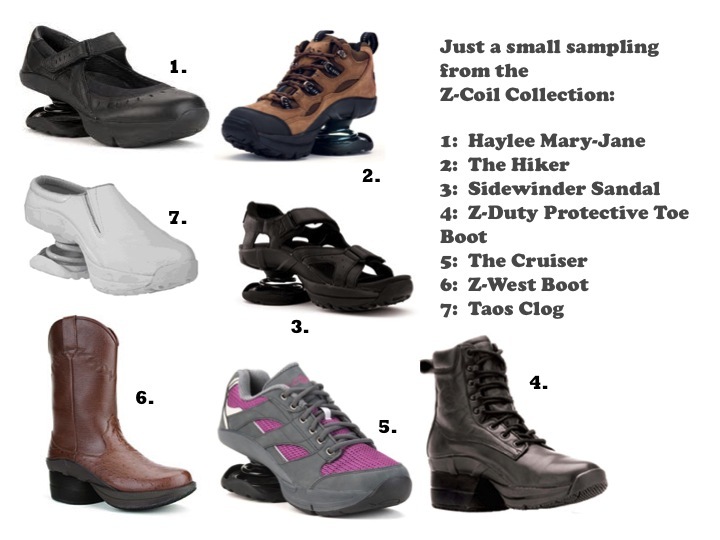 They also come in a variety of styles suitable for any occasion: sandals, sneakers, mary-janes, boot and more and can be purchased online here or at select Z-coil retailers. For the Gouls, I opted for the simple sneaker. Once we had them in the office, we started noticing them everywhere: In his boating school class, at the Treasure Island Music Festival, in Union Square. I also started spotting them on public figures: Former president Bill Clinton, Google co-founder Sergey Brin, musician Lenny Kravitz and actress Helena Bonham Carter. All of these people are pretty genius in their various fields, big personalities and bold in their life choices. None would be considered A-list celebrities, but they are A-students and Z-Coil fans. There must be something here.